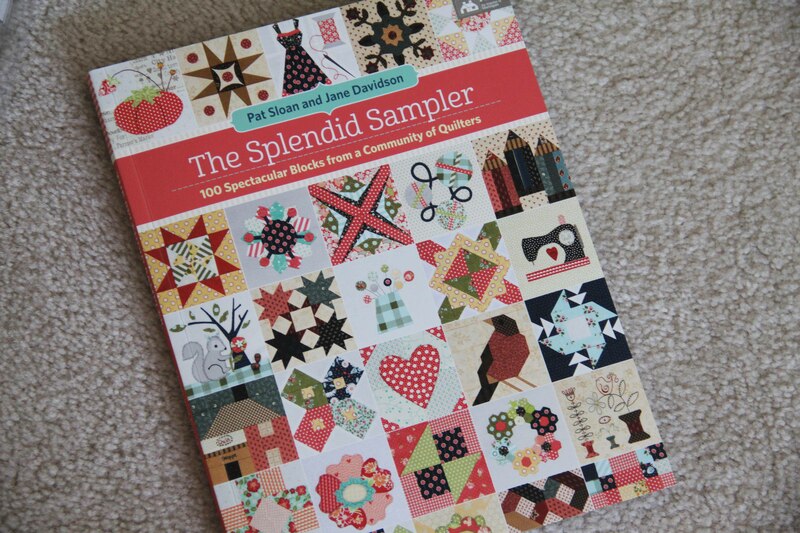 Splendid Sampler on the Move! 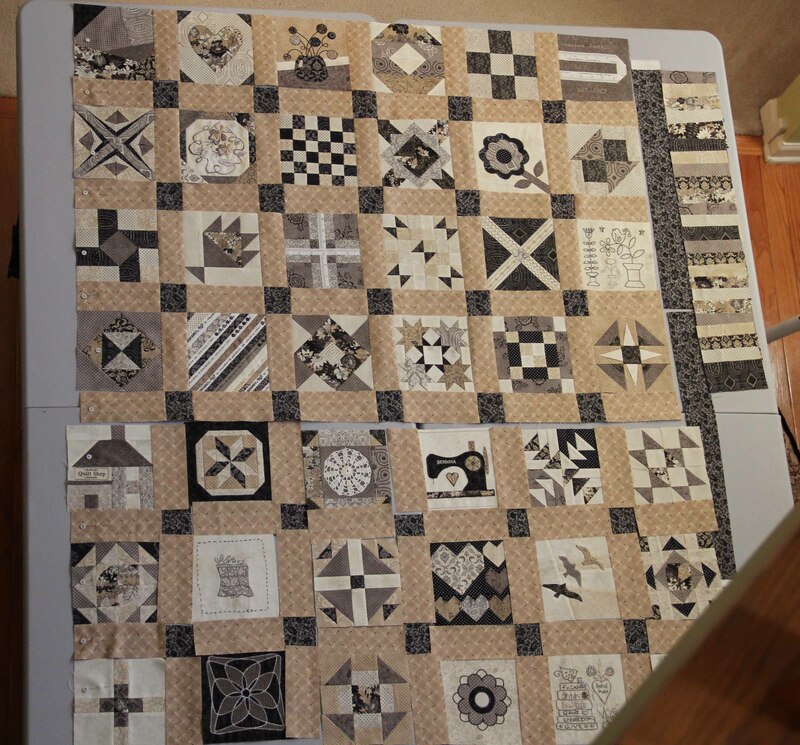 Finally, I am moving forward with my Splendid Sampler quilt. I wrote about it here and here. I would like to say that I completed all 100 of the blocks, but alas, life happens and I am a firm believer in stopping while I’m ahead. At first I did every block that came my way, regardless of the techniques. I quickly realized that I never want to sew hexies. I mean *never*. Especially not 1 inch ones. And I realize that I may make enemies this way, but not everyone likes the same thing and that is just fine. If you love tiny hexies, bless your heart. If you like bunnies and squirrels on your quilt, bless your heart as well. And if you really love tiny paper-piecing, you’re probably going to heaven too. It is laid out in our foyer, and I am finalizing the way to finish it. As you can see, I was pretty strict about the color palette. Thankfully, I still love the colors. Something about the neutrality of it makes it slightly less traditional. As you can see, I’ll probably stick with the dark inner border and a “piano key” outer border. I have so many scraps left over, I will easily be able to use them up as the border. I gain a little size there too. I have no room to store them. I don’t want to pay someone else to quilt them and I absolutely cannot handle queen size on my domestic machine, at least not with any quality. But I did learn some new techniques. And I reignited a love of hand embroidery, which is quite popular right now. It really does take a lot of time. As you can see, the left side is done by hand, the right side I just digitized and stitched out in machine embroidery. Sometimes the new block would be announced and I would think (I’m being honest here), “Not another hand embroidered block. I don’t have time this week.” At that point I was reminded of Indiana Jones in the scene with the Samarai wielding the giant sword. Indy, exhausted, whips out his gun and shoots him. After days of finishing one hand-stitched block, if another came up, I just went to the computer, digitized it in software, and within an hour, machine embroidered the next block. It’s cheating, I know. Over 20,000 quilters started this project back in February 2016. I would love to know how many finished a quilt! This entry was posted in embroidery, machine embroidery, quilting, sewing, The Splendid Sampler by edges. Bookmark the permalink.